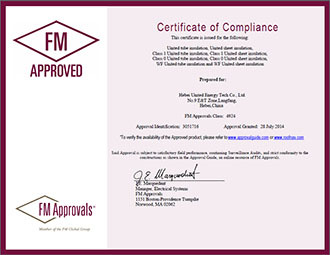 FM Approvals has been made aware of a falsified FM Approvals Certificate of Compliance (CoC). The document (attached as Figure 1) is an image of the falsified CoC misrepresenting “Hebei United Energy Tech Co., Ltd.” as FM Approved. Hebei United Energy Tech Co., Ltd. has no relationship with FM Approvals. The valid CoC in Figure 2 was issued to FM Approvals customer Jiangsu Zhaosheng Building Material Co Ltd.
Counterfeit Company Identity: Hebei United Energy Tech Co., Ltd.
Counterfeit Product Identity: United tube insulation, United sheet insulation, etc. Figure 1 depicts the falsification of the actual FM Approvals Certficate of Compliance. The authentic document is identified in Figure 2. FM Approvals did not issue the Certificate of Compliance illustrated in Figure 1. FM Approvals has no relationship with Hebei United Energy Tech Co., Ltd. See Figure 2 for an illustration of the authentic Certificate of Compliance. 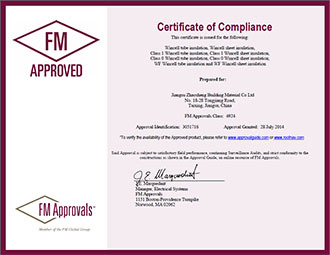 Figure 2 depicts the actual FM Approvals Certficate of Compliance issued to FM Approvals customer, Jiangsu Zhaosheng Building Material Co Ltd. The counterfeit document in Figure 1 misrepresents the company name, address and the actual FM Approved products.